A prisoner who died from a blood clot in his lungs had set fire to himself while high on Spice three weeks earlier, an inquest heard. Kevin Hilton, 31, was found convulsing and alight in his segregation cell at HMP Whitemoor in March, Cambridgeshire, on 8 December 2017. After being treated in hospital, he was returned to the jail where he died on 30 December, the inquest in Huntingdon was told. Jurors ruled he died of natural causes. 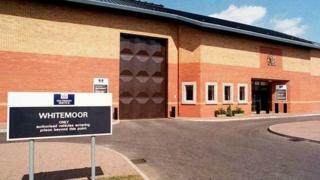 Hilton was discovered in his cell by a prison officer at about 21:15 GMT, Cambridgeshire Coroner's Court heard. An ambulance was called and a hosepipe used to douse the flames without opening the door. After fracturing a prison officer's eye socket two days earlier, Hilton's "unlock level" required four officers trained in safe restraint to be present before the door was opened, the officer explained. It was 20 minutes before they entered, but the jury was told the delay in delivering first aid would not have affected Hilton's recovery. He was taken to hospital with 15% burns, made a good recovery and was discharged early to Whitemoor's hospital wing. A fellow inmate told the inquest he "regularly" saw Hilton smoking Spice and said he knew how to create a flame using a spark from an electrical socket. The inquest heard after Hilton was returned to Whitemoor his health deteriorated and a GP put him on antibiotics on 29 December but he was seen well and responsive three times on the morning of 30 December. A prison officer said shortly after 07:45 GMT he realised Mr Hilton "did not look right". CPR was administered, but despite ambulance support he died. Post-mortem tests found the cause of death was a pulmonary embolism.